I had to order a new pair of wireless headphones, as my ones blew up :-(, so got some of ebay these were around £10, though various sellers are selling them at anything from £8 – £20, so thought would do a quick review on these. In the box you get the headphones, transmitter, 3.5mm – 3.5mm audio cable, 3.5mm to 2x phonos, and attached to the transmitter is a cable to 2x phonos and a very basic instruction booklet. the headphones require 2x AAA batteries and so does the transmitter, the headphones themselves with just batteries in can be use as just a auto scan FM radio, this does work well and had no problems getting any radio stations. on the bottom of the headphones there is a 3.5mm jack this is used with the supplied cable to you the headphones in wired mode. 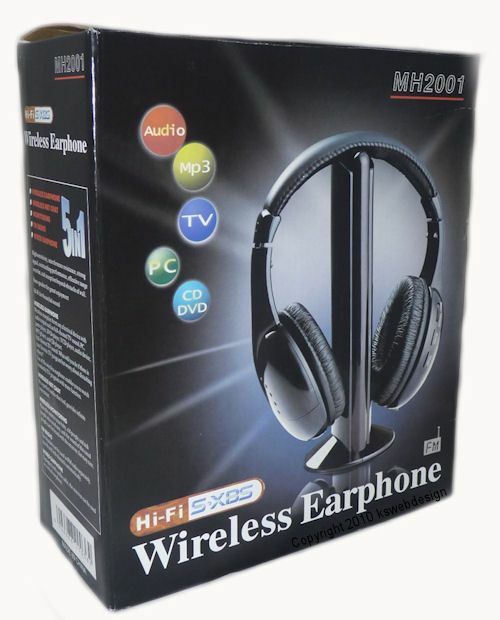 To use them in wireless mode all you do is turn on the transmitter and then the headphones and you are ready to go. I tested in various modes wired, and wireless from various sources but the volume didn’t seem loud enough, the quality of the sound is good, you get goof treble and pretty good bass, but just not really load enough, which is a surprise that when u you just the FM radio mode the volume is very good, but when from any other source, not really load enough. 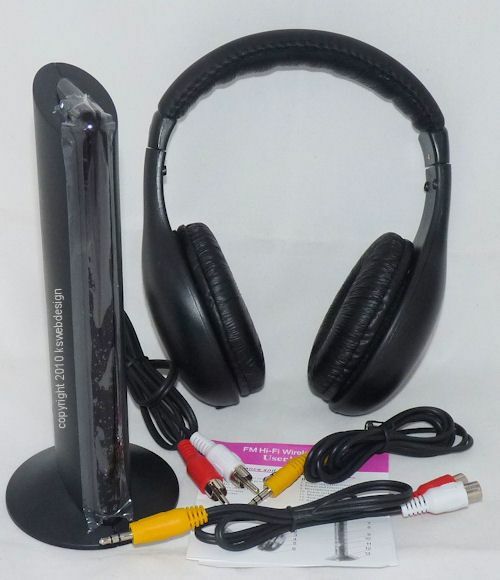 You can also use these headphones as a monitoring system ie if you leave the transmitter in one room, and have the headphones on you can hear whats going on in that room from the built in microphone on the transmitter. My final opinion on these for the price you cant go wrong, but was disappointed with the volume level on all sources other than the built in FM radio, so if looking for a good cheap wireless headphones head over to ebay and you will find some bargains, but if you looking for a good volume for you music look elsewhere. I have seen these in the cheaper shops ie home bargains / B & M stores lately at the bargain price of £4.99 or £6.99, they still do suffer from the problems noted above, but good value for money. The main problem with these headphones is that they are only mono sound when in wireless mode, if you connect direct with the cable the sound quality is stereo. hello!,I like your writing so so much! share we communicate more approximately your post on AOL? I require a specialist on this house to solve my problem. May be that’s you! Having a look ahead to peer you. i have just bought some boombeat headphones to listen to the tv, the only trouble is i am finding it hard to find tv only radio coming through been trying for two hours now.